Stoplight safety reduces car accidents a great deal. However, during 2000 to 2007 the Fatality Analysis Reporting System (FARS) reported approximately 800 to 1,000 fatal car accidents at intersections from drivers running a red light. In addition to that, about 100,000 to 125,000 people are injured from drivers running a red light. When you are driving, it is a driver’s responsibility to obey all traffic control signals to avoid causing a car accident. With stoplights, we all know Green means go and Red means stop, but did you know that yellow does not mean slow down (or speed up)? All a yellow light means is to be prepared because the light is about to turn red! Also, pay attention to where you stop at a red light. You can be cited for running a red light if you fail to stop at the stop line, if there is one, or before the crosswalk at an intersection. Disputes about what color a light was in an accident is often a sticking point in a case. 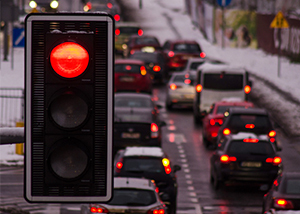 If you are injured in an accident caused by someone violating a stoplight, you need a personal injury lawyer in Spokane on your side. Our experienced and knowledgeable attorneys at Parke Gordon Law Firm will work hard to get you the compensation you deserve. Contact the law office of personal injury attorney Mat Parke today for a free consultation. This is your opportunity to speak with an experienced personal injury attorney about your case for free. Call (509)482-7274 to get started on receiving a fair settlement from your personal injury case. RCW 46.61.055: Traffic control signal legend. (a) Vehicle operators facing a circular green signal may proceed straight through or turn right or left unless a sign at such place prohibits either such turn. Vehicle operators turning right or left shall stop to allow other vehicles lawfully within the intersection control area to complete their movements. Vehicle operators turning right or left shall also stop for pedestrians who are lawfully within the intersection control area as required by RCW 46.61.235(1). (b) Vehicle operators facing a green arrow signal, shown alone or in combination with another indication, may enter the intersection control area only to make the movement indicated by such arrow, or such other movement as is permitted by other indications shown at the same time. Vehicle operators shall stop to allow other vehicles lawfully within the intersection control area to complete their movements. Vehicle operators shall also stop for pedestrians who are lawfully within the intersection control area as required by RCW 46.61.235(1). (c) Unless otherwise directed by a pedestrian control signal, as provided in RCW 46.61.060 as now or hereafter amended, pedestrians facing any green signal, except when the sole green signal is a turn arrow, may proceed across the roadway within any marked or unmarked crosswalk. (a) Vehicle operators facing a steady circular yellow or yellow arrow signal are thereby warned that the related green movement is being terminated or that a red indication will be exhibited immediately thereafter when vehicular traffic shall not enter the intersection. Vehicle operators shall stop for pedestrians who are lawfully within the intersection control area as required by RCW 46.61.235(1). (b) Pedestrians facing a steady circular yellow or yellow arrow signal, unless otherwise directed by a pedestrian control signal as provided in RCW 46.61.060 shall not enter the roadway. (a) Vehicle operators facing a steady circular red signal alone shall stop at a clearly marked stop line, but if none, before entering the crosswalk on the near side of the intersection or, if none, then before entering the intersection control area and shall remain standing until an indication to proceed is shown. However, the vehicle operators facing a steady circular red signal may, after stopping proceed to make a right turn from a one-way or two-way street into a two-way street or into a one-way street carrying traffic in the direction of the right turn; or a left turn from a one-way or two-way street into a one-way street carrying traffic in the direction of the left turn; unless a sign posted by competent authority prohibits such movement. Vehicle operators planning to make such turns shall remain stopped to allow other vehicles lawfully within or approaching the intersection control area to complete their movements. Vehicle operators planning to make such turns shall also remain stopped for pedestrians who are lawfully within the intersection control area as required by RCW 46.61.235(1). (b) Unless otherwise directed by a pedestrian control signal as provided in RCW 46.61.060 as now or hereafter amended, pedestrians facing a steady circular red signal alone shall not enter the roadway. (c) Vehicle operators facing a steady red arrow indication may not enter the intersection control area to make the movement indicated by such arrow, and unless entering the intersection control area to make such other movement as is permitted by other indications shown at the same time, shall stop at a clearly marked stop line, but if none, before entering a crosswalk on the near side of the intersection control area, or if none, then before entering the intersection control area and shall remain standing until an indication to make the movement indicated by such arrow is shown. However, the vehicle operators facing a steady red arrow indication may, after stopping proceed to make a right turn from a one-way or two-way street into a two-way street or into a one-way street carrying traffic in the direction of the right turn; or a left turn from a one-way street or two-way street into a one-way street carrying traffic in the direction of the left turn; unless a sign posted by competent authority prohibits such movement. Vehicle operators planning to make such turns shall remain stopped to allow other vehicles lawfully within or approaching the intersection control area to complete their movements. Vehicle operators planning to make such turns shall also remain stopped for pedestrians who are lawfully within the intersection control area as required by RCW 46.61.235(1). (d) Unless otherwise directed by a pedestrian signal, pedestrians facing a steady red arrow signal indication shall not enter the roadway. (4) If an official traffic control signal is erected and maintained at a place other than an intersection, the provisions of this section shall be applicable except as to those provisions which by their nature can have no application. Any stop required shall be made at a sign or marking on the pavement indicating where the stop shall be made, but in the absence of any such sign or marking the stop shall be made at the signal.